The dynastic Edmonton Oilers of the 1980s had a heavy European influence. Glen Sather particularly favored Finnish hockey players and had great success bringing them into the fold - Jari Kurri and Esa Tikkanen first and foremost, but also the likes of Risto Siltanen, Reijo Ruotsalainen, and Matti Hagman. So there was some unwarranted fanfare when Sather brought over Raimo Summanen, the pride of Jyvaskyla, in 1984. Jari Kurri was Wayne Gretzky's favorite target, but the dynamic duo could never find the perfect fit on left wing to complete a definite line. In the days prior to Esa Tikkanen's arrival, it was widely hoped that Raimo Summanen could step in and fill the role. The Oilers had even proclaimed as much prior to his arrival. Talk about great pressure. But it all looked promising at first. Summanen had just come off of a strong showing at the 1984 Sarajevo Olympics. He and linemate Petri Skriko led all Finnish skaters with 10 points at those Olympics. The duo previously set records (along with Risto Jalo) at the World Juniors in 1982. Summanen's reputation as Finland's next big scorer raised expectations sky high in Edmonton, where fans had grown to love Jari Kurri's great exploits. Summanen played in 2 regular season games after those Olympics, scoring an impressive 1 goal and 5 points. He added another goal and 5 points in 5 Stanley Cup playoff games, but was scratched in favor of Jaroslav Pouzar for much of the rest of the post-season as the physicality stepped up. The Oilers won their first Stanley Cup. It was a very impressive start to his NHL career. Then it all sort of slipped away. He showed flashes of brilliance in an otherwise below ordinary career. He had good speed but did not always keep his feet moving to drive defensemen back off of the blue line. Physically he a very tentative player, shying away from the boards and corners. He could be easily muscled off the puck. He seemed to struggle adjusting to the North American game, often wandering from his position. Then again, playing with Gretzky and Kurri meant you had to throw the playbook out the window and completely improvise, which is why it was so hard to find the perfect left winger. To many people's surprise Summanen was demoted to the minor leagues in 1984-85, dispatched to apprentice and learn the North American game. 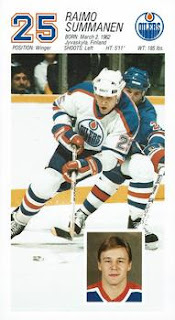 He played his only full season in Edmonton in 1985-86, scoring 19 goals and 37 points in 73 games - low numbers on a team with 4 players who scored 48 or more goals. After another lacklustre season in 1986-87 the Oilers dispatched Summanen to Vancouver late in the season, swapping the Finn for big bodied Moe Lemay. There were great hopes in Vancouver that the reuniting of Summanen and Petri Skriko would result in great things in Canucks-land. But Summanen would play just 19 games over 2 seasons in Vancouver. In 1988 Raimo Summanen packed up his NHL career (151 games, 36 goals, 40 assists, 76 points) and headed back home to Finland where he continued to play for several seasons. He later became a prominent coach. Was a hated coach. Got fired as Finnish national team coach shortly after Finland lost to Canada in 2004 World Cup final. Surprising after an impressive showing, but Finnish officials likely weren't happy about Finnish star Janne Niinimaa leaving the team during the tournament over differences of opinion with Raimo Summanen.